Pi Artworks Istanbul is proud to present Allen Grubesic’s first solo show in Turkey, having previously represented his work for the first time at Contemporary Istanbul 2014. Experimental Evidence will showcase various installations that reflect different sides of his artistic practice. Grubesic's new exhibition Experimental Evidence combines contemporary themes with a nostalgic style. As the artist himself puts it, he pixelates the absurd realities of today, translating them into a familiar but complicated language. The subject of 'conspiracy theories', which has an important place in the artist's practice, is also a dominant theme in this exhibition. In one of his works Grubesic uses an actual code published by the British intelligence agency GCHQ (Government Communications Headquarters) to recruit talented new members. Even if the signs he carefully processes on metal plates appear nonsensical at first glance, they may well hide a vital secret within. These codes remind us of conspiracies past and present, and the conspiracy theories, which have dragged, some people into a world of paranoia. In this exhibition the main materials are cotton and metal, and the main colours -alongside the natural colour of the canvas- black and white. In one place, the cotton canvas is stretched over a frame, while in another it is used as fabric to create clothing. The artist has produced a jacket for each day of the week, and by making clothes that carry traces of a person’s experiences, from food eaten to places visited, the artist includes the individual within the exhibition. With a striking installation in Experimental Evidence, Grubesic salutes the legendary Dada art movement. According to the artist, this movement, which was born as a reaction against the First World War, gains a different meaning in Turkey's current situation. In addition, 'Da' means 'yes' in some languages. By writing this word again and again, one after the other, the artist makes it lose its original meaning and redefines it in a new context. This repetition-based approach appears in a different context in a new work titled WTFFTW, where he combines two contradictory acronyms from the internet world, repeating them over and over. Grubesic's works are concerned with existing systems. In this system, where chaos and order exist in opposition, but at the same time follow one other, the artist explores how peace is replaced with disorder. His calm-looking works contain criticism, anger and reaction. He filters the absurdity in the air and reveals it in unusual ways, but in doing so he never gives up his exact, careful technique and aesthetic approach. Allen Grubesic (b. 1974) graduated from The Royal Institute of Art in Stockholm in 2003. He has exhibited his work at the galleries and art institutions including Gallery Niklas Belenius, Stockholm (2014); Maria Stenfors Gallery, London (2011); Lautom, Oslo (2009); Laviola Banks Gallery, New York (2008); Tensta Konsthall, Stockholm (2007); Nationalmuseum, Stockholm (2005); Kiasma, Helsinki (2004); Bibliotheca Alexandria, Egypt (2004); Kunstlerhaus Bethanien, Berlin (2002); Moderna Museet, Stockholm (2002). 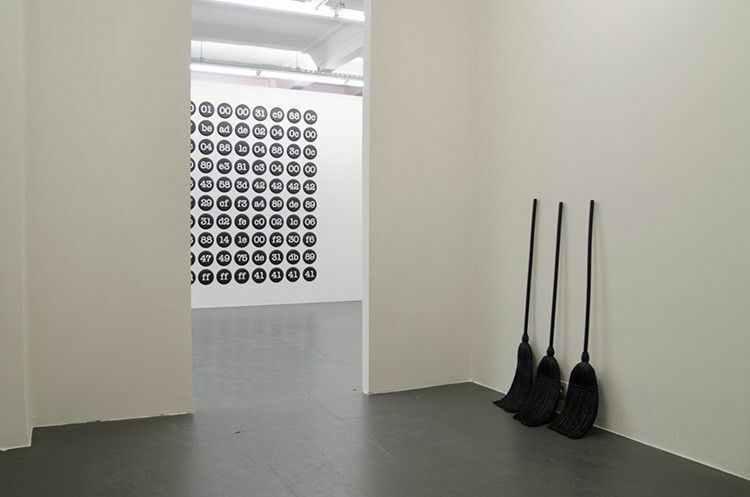 In Istanbul the artist’s works were exhibited at Contemporary Istanbul art fair (2014), the exhibition titled “Silence is Appreciated” at Manzara Perspectives (2009) and “On Produceability” at 5533 (2008). Grubesic's installation is a part of the exhibition "Powerful Babies", curated by Rick Herron and Bill Arning, which takes place at Spritmuseum, Stockholm until 3 April 2016.